So what are you waiting for? With the lifetime warranty, get your Innoo Tech baby wrap on risk free! Click the Add to Basket before stock runs out - and because your baby deserves it! And remember to order one for your friend having a baby! You will love the smile in the face! ♥THE SAFEST AND MOST COMFORTABLE BABY WRAP ON THE MARKET. Your baby will feel as snug as a bug in our comfort fabric which is made from 95% pure cotton and 5% spandex. Our baby wraps have been tested and certified to CEN TR 16512-2015 (Europe) and ASTM F2907-15 (USA) standards, meaning their safety and quality are guaranteed. Other similar brands haven't achieved these accreditations. Feel secure to use our products! 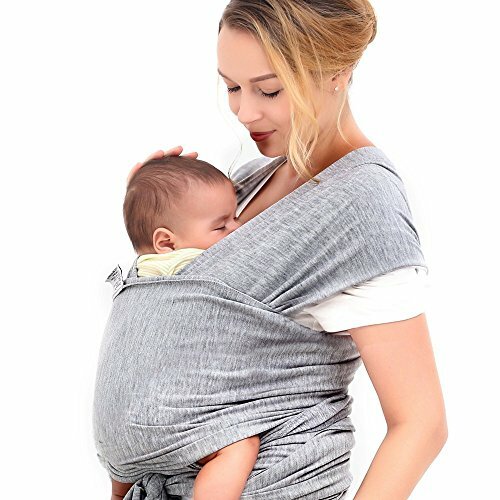 ♥ENJOY HANDS FREE - With the baby wrap, you have free use of both of your hands. You can wash dishes, go for walks, go shopping or walk your dog while quieting a restless baby. Both mommy and baby are happy! ♥ENHANCE THE BOND WITH BABY - Babies all love being close to mommy! Stay close to mom's heart, a baby can hear your beating heart and feel the warmth from your body in the wrap where he can feel peace of mind. ♥REDUCES CRYING - When the baby is cuddled in our baby wrap, its muscles relax and crying will not come easily. With relaxed muscles, it's much easier for the baby to fall asleep. Cuddled in our baby wrap, baby can have the peace of mind when seeing mommy at all times! ♥ONE SIZE FITS ALL - Perfect for newborns, infants and toddlers. It's durable and cozy! No longer need to buy another baby carrier or baby sling.